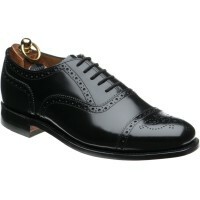 Has there ever been a more classic men's shoe than the black Oxford? Arguably the most famous of the English shoe designs, as a gentleman’s wardrobe staple, black Oxford shoes are the go-to footwear choice for anyone who wants that debonair yet elegant look. Here at Herring Shoes we carefully select products that are crafted from the best quality materials and made to the highest standards, and offer a wide selection of men's black Oxford shoes from leading manufacturers. 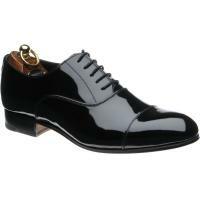 The distinctive feature of Oxfords is the way that the shoelace eyelet tabs are fitted under the vamp of the shoe. This gives a much sleeker and smoother appearance when compared to other shoe types. The quality, grace and sophistication of a pair of black Oxfords make them ideal for any formal occasion whether day-to-day use at work or for special occasions like a wedding or birthday party. If there is a formal event that you want to impress at, then these are the shoes to choose. To learn more about Oxford shoes click here.